Instead of taking the Mazda3 like we would usually do, we thought it would be a good idea to take the pickup truck for this mission. Great call. We picked up our friend, Lauren. Then headed out to get some food before our long drive to nowhere. Last stop in L.A. was at Subway. They took waaaay to long. Never again. So we were actually heading out to the poppy fields somewhere not to far from Lancaster. 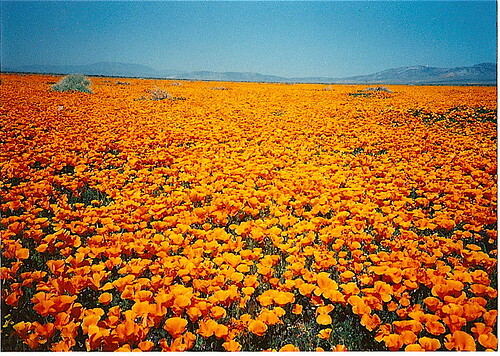 Why would 3 L.A. kids want to go to see some Poppies? Well, why not? So there was kind of a problem once we reached our destination. We couldn’t really find the poppy fields, we were pretty sure we were in the right area but didn’t see any of THESE. After checking our iPhones for information, we found out that the poppy season just ended. I hate to say this but…FML. So now we were stuck in the middle of nowhere. After finding out the bad news, Ron and I kinda got into an argument. We ended up whipping out our switchblades and going at it. Actually, we just thought it would be fun to attack each other with switchblades. Here are some pics I took with my iPhone using the ShakeItPhoto application. It basically adds a polaroid effect to photos. only 99¢. I don’t think I’ve ever had so many layers when using AE. Usually I would do greenscreen for AA, but not so much this time. I just got back home from the most epic music festival that I’ve ever been to. I’m sure you’ve heard of it, it’s a 3 day event with tons of performances and art to keep you entertained for hours! That’s right, I went to Coachella. With Val’s dad(Jose), driving and me backseat DJing, the drive to Palm Springs wasn’t as dreadful as I expected it to be. Once we got to our hotel we decided to relax poolside with some friends whom met up with us there. The weather was just right in Palm Springs. Afterward, we went to this Benihana-ish place. Our chef, Jeremy, was pretty hilarious…stand-up chef comedy is where it’s at. It was hot at Coachella, but that didn’t stop anyone from enjoying the day. The first sets I saw was Para One and Surkin. Both DJs killed it in different ways. After the sets in the Sahara tent, I headed out to TV On The Radio. They performed great, but I think they performed a bit better when I saw them in San Francisco. M.I.A.’s performance was full of energy. She even had some of the audience come up to the stage. One of the last performances I saw on Saturday was MSTRKRFT. I’ve seen MSTRKRFT about 3-4 times and I can gladly say that they get better every time I see them. They performed a lot of tracks from their new album ‘Fist of God’. To end their set, they had John Legend come out and perform the MSTRKRFT remix of ‘Greenlight‘ and one of my favorite songs off of Fist of God, ‘Heartbreaker‘. It was an incredibly hot day on Sunday(hotter than Saturday). Caught some shade in the Sahara ten while listening to Busy P mixing it up for a bit. Lykke Li’s performance was very enjoyable, especially when she performed ‘A Milli’ at the end. Everyone was looking foward to the Yeah Yeah Yeahs including myself. They played older tracks and some new stuff off of their latest album ‘It’s Blitz’. Etienne De Crecy set started and ended with a bang! The visuals we beyond creative.